Switzerland has got a dense railway network with good connections also to its neighbor countries. Public transport in general is of high standard. Travelling by train is quite comfortable and recommended very much. If you arrive at Bern rail station, walk along the platform to the underpass in the direction 'Universität Länggasse'. At the end of the underpass you see three elevators. Take one to the top floor. Turning right around the elevator-building, you are facing the main University building, on the right side there is a modern building with various astronomical instruments on the roof (see photo below). This is the building 'Exakte Wissenschaften' where our institute is located. Take the park-side entrance (marked with a red circle on the photo). 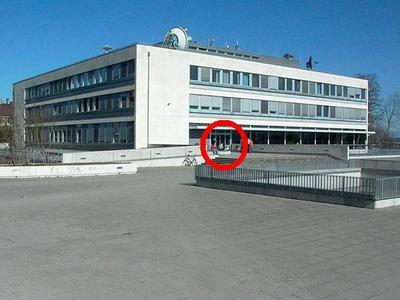 Our secretariat is situated in room 014 on the ground floor - when you are inside, just take the first door on the left. If you want to learn more about trolleybusses and trams in the city of Bern, visit the home page of Bernmobil (in German). Tickets can be purchased with Swiss cash. MasterCard or VISA are also accepted. An online timetable is available. Bern's local airport, Flughafen Bern-Belp, is served by Skywork, Lufthansa and several more airlines. There are connections to several European cities, e.g. London, Amsterdam, Paris, Wien. The airport is connected to the city center by a combination of bus and train: The AirportBus 334 links the Airport with Belp station, which is connected to Bern central station by several S-Bahn lines (S3, S4, S31 and S44). The entire journey takes about 30 minutes. If you come by by car, it will be best to leave the motorway at the exit 'Bern Neufeld' or 'Bern Forsthaus'. The routes from the motorway exits to the institute are accurately described below. Be sure to have a parking disk with you. You will need it in order to park in the so called 'Blue Zones'. However, at most times parking in blue zones is limited to one and a half hours. Longer lasting parking permits (4 hours / 24 hours) for the blue zone are available from ticket machines at many bus stops for CHF 9.-/CHF 16.- . Using a public multi-story car park (in German) is possible though quite expensive. Exit 'Bern Neufeld': Drive in direction 'Zentrum' on 'Neubrückstrasse' until you reach a roundabout. Take the first exit off this roundabout into 'Mittelstrasse'. After three blocks turn left into 'Gesellschaftsstrasse'. The building straight ahead is the 'Exakte Wissenschaften'. Please note: There is a multi-story car park right at the exit 'Bern Neufeld': Park + Ride Neufeld (in German). Exit 'Bern Forsthaus': Drive in direction 'Tierspital' on 'Bremgartenstrasse' until you reach a roundabout. Take the third exit off this roundabout into 'Länggassstrasse'. After about 800 meters (You just passed the building 'Uni Tobler' on your right) turn left on a traffic light into 'Mittelstrasse'. After one block turn right into 'Gesellschaftsstrasse'. The building straight ahead is the 'Exakte Wissenschaften'. To get more information about the location have a look at the Maps section. 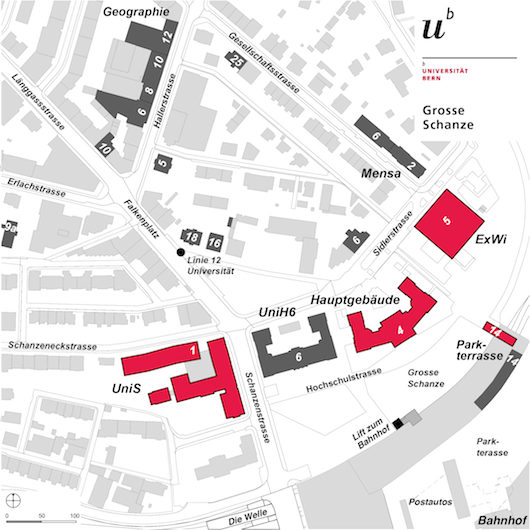 The following detailed map of the environment of our institute can be found on the university maps page. Our institute is located in the 'ExWi' building on the right. Right below to the left there is the university main building. At the same location you can find a detailed map of the entire city of Bern with the motorway exits 'Bern Neufeld' and 'Bern Forsthaus' in PDF format. The sites map.geo.admin.ch and map.search.ch provide the possibility to search the map detail corresponding to any given address in Switzerland. Please contact our secretariat to book a room at one of the following hotels. Special rates apply for bookings through our institute. A list of further hotels can be found here.